Queue the Indiana Jones theme… Okay not really. More likely queue Darth Vader’s entrance music because working with Vallejo’s Still Water is like a trip to the dark side. 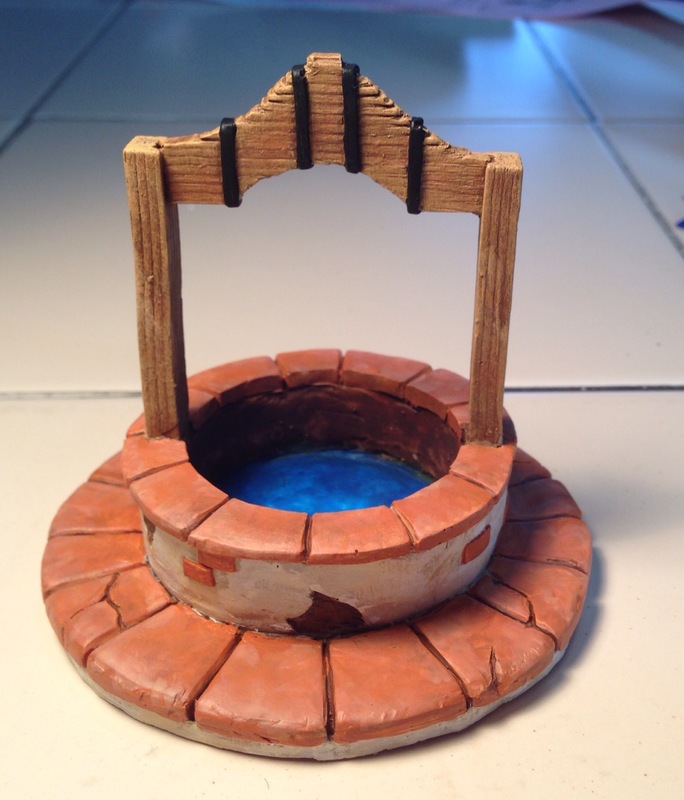 So, the town well was finished except for the water effects. 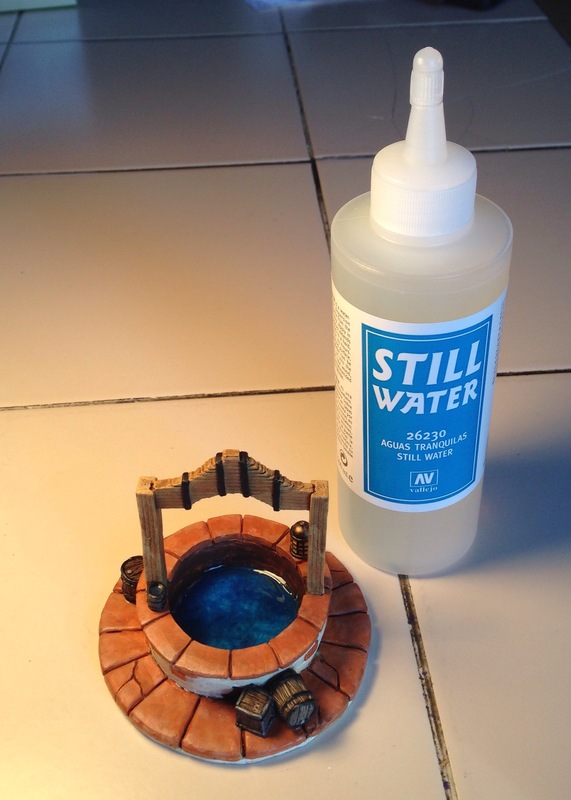 I’ve used two part resin water effects before but I didn’t have any so I thought I’d try to something new. Enter Vallejo’s Still Water. This is a no-mix clear acrylic product that dries in about 24 hours. Or so it says. What really happens? I followed the directions and poured the product to the recommended depth and then put it aside to dry. 24 hours later it was slightly gelled but certainly not dried. Okay. It was cold here so I waited another day. Behold! It dried. It shrunk so much that it literally pulled away from the wall of the well. About 20% of the “water” along the perimeter was left uncovered. The product had pulled about 1 1/2 mm from the wall the full depth of the pour. I know. 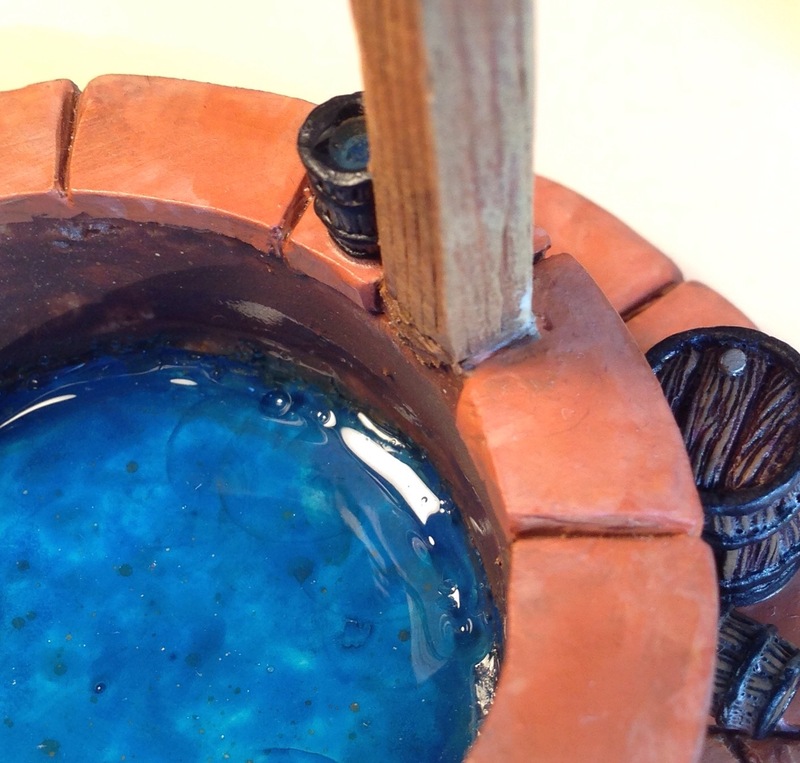 I’ll fill the gap with more Still Water and pour a little extra just to insure a smooth top layer! So I did. This thin layer did dry faster. In fact within 24 hours. However, again the product pulled away. Ahhh… Part 2! Well, not as far this time. No. I poured it a third time. This time it didn’t pull away… Yet… But it did shrink again and sink to form depressions where the previous layers pulled back. Also, it appears to form voids where the layers may pull back at different rates. Overall the flaws in the effect are not extremely noticeable but it has been 5 days getting to this substandard result! A two part resin would have been flawless four days ago. I’m afraid to try adding another layer to smooth it out as it may just pull away again. All in all, I would not recommend this product for pouring a water effect. In the future I’ll just stick with a two part epoxy resin. I added a few detail items to the town well. Just a few random parcels and a lantern. The small additions really make the well come “alive” with day to day activity. 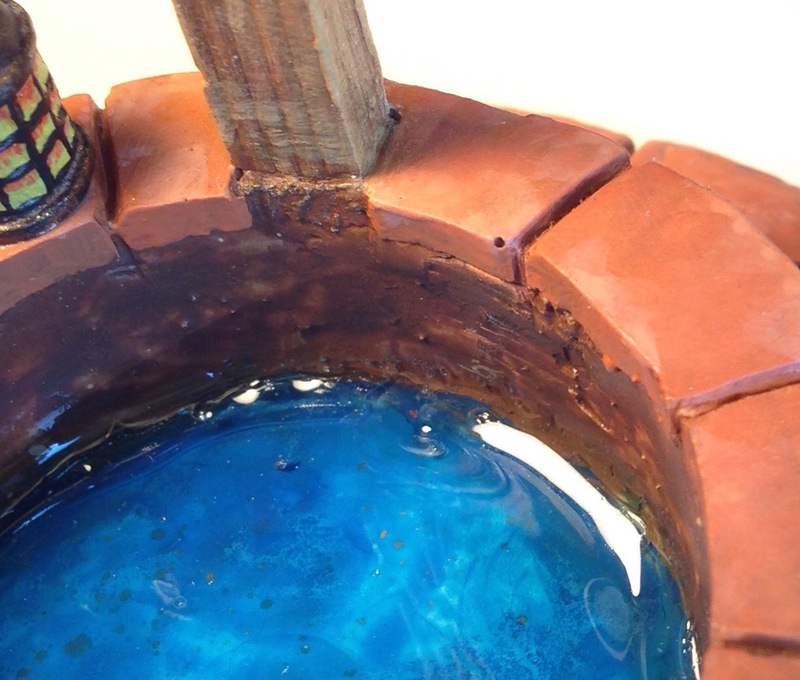 The only part of this model that is not complete is pouring some water effect inside the well. I don’t have any at the moment so that will have to wait. Overall, I like the way it has turned out! It wasn’t really difficult to do either. The worst part was making the molds to reproduce the parts, but if you’re just making one for yourself that part really doesn’t matter. Sculpey is a versatile product that works well before baking and still seems to behave for post bake detailing. I will definitely use this product and methods again. 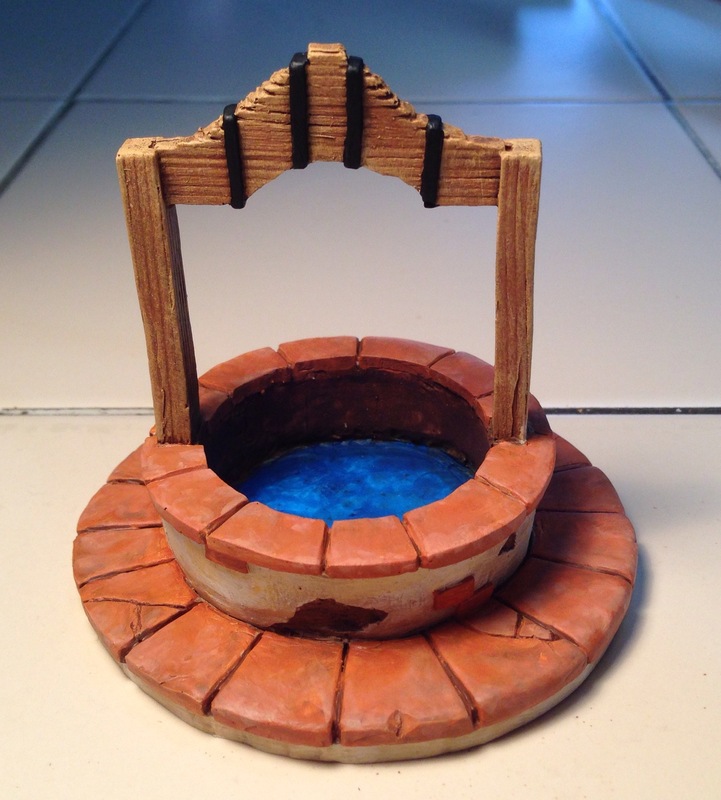 Perhaps I’ll even look into doing some other scenery pieces and adding a small line of them to the shop. Inspired by the photos of Robjedi’s pirate town, I dove in and ordered the three “Sand Buildings” from CNC Workshop Miniature Scenery in Australia. They arrived safely packaged and even quicker than I had expected. My final cost was $77 including international shipping to the U.S. Drawing on Robjedi’s work for both inspiration and blatant imitation, I went at the first building with drill and saw and sandpaper and glue. I like it so far. The MDF board that the model is cut from delaminates easily so I simply used a hobby knife to carve in some exposed brickwork. I left the horizontal flooring pieces alone for now. A few additional walls were cut from scrap MDF to cover the openings behind the stairs and behind the arched area on the first floor. The doors, shutters and trim are all made from craft sticks with grain pressed into them using a machinist’s thread restoring file. The doors are removable at this point. I’ll glue them in place after the stucco and paint are done. 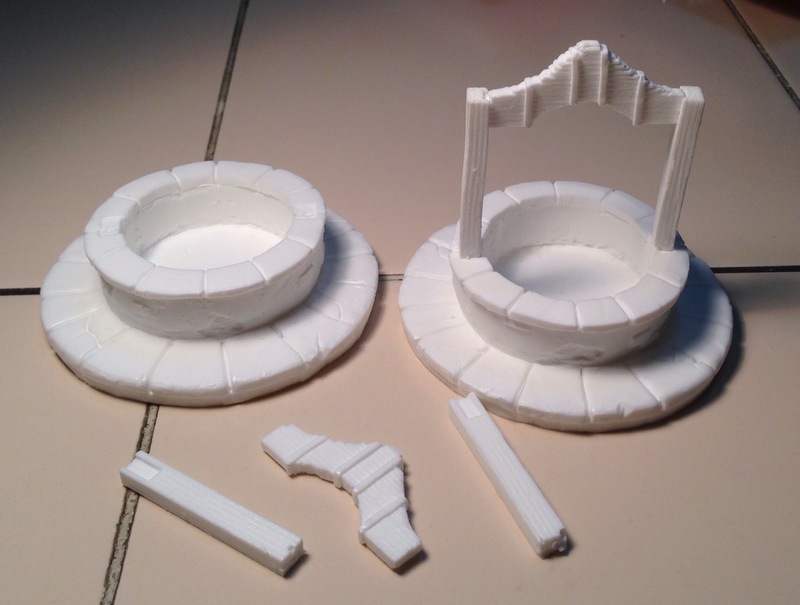 Or, that’s the plan anyway: Stucco, paint, finish structure assembly and then mount on a base and add details. I’ve been quiet here for a while but not completely inactive in the real world. 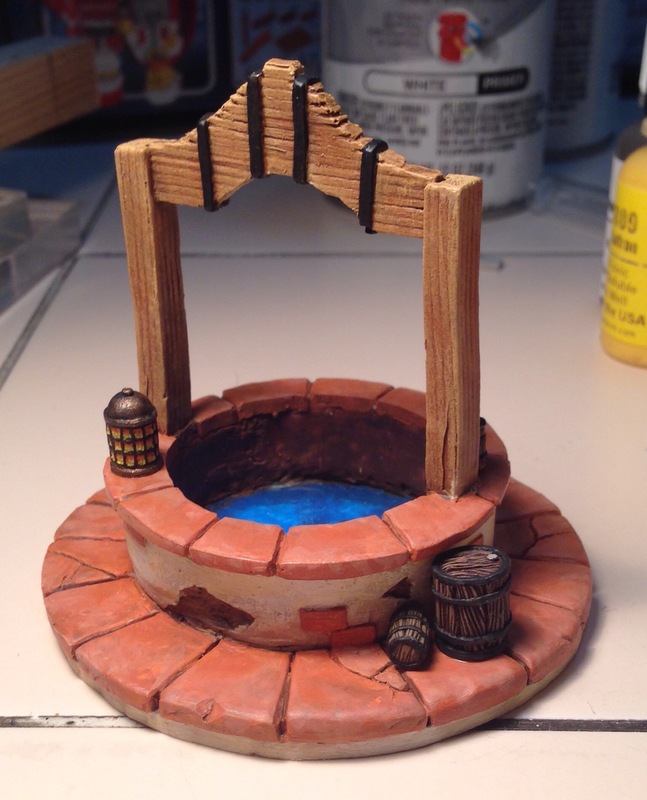 One project that I started and “finished” is a town well terrain piece. 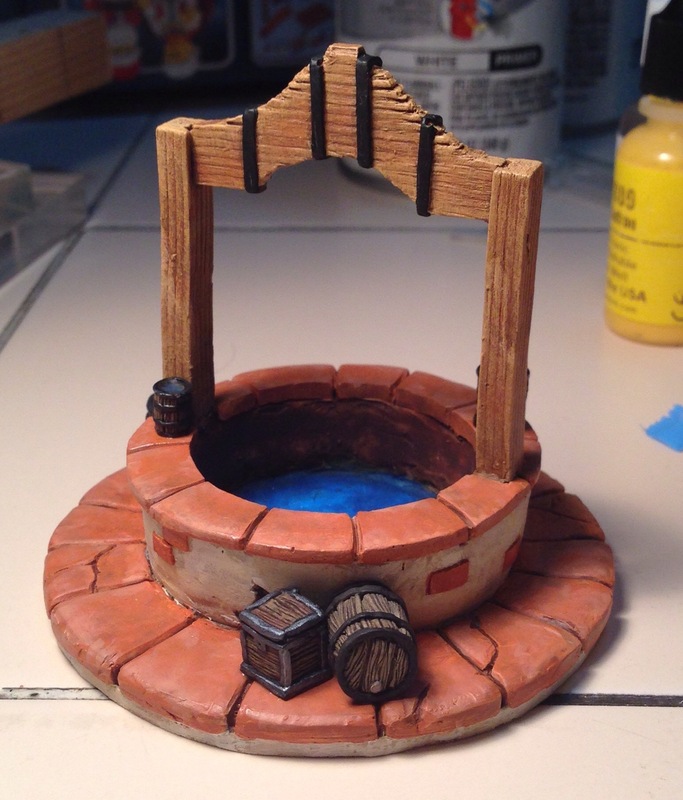 It still needs a few detail pieces like barrels and buckets and a splash of water effects inside, but it’s basically done as a terrain piece. I started the project using Sculpey. I sculpted the base structure and then baked it. Then I carved in some details and added some extra bricks using Greenstuff. The original upper structure is made of bass wood scraps again detailed with Greenstuff. With the original “done”, I made a couple molds. 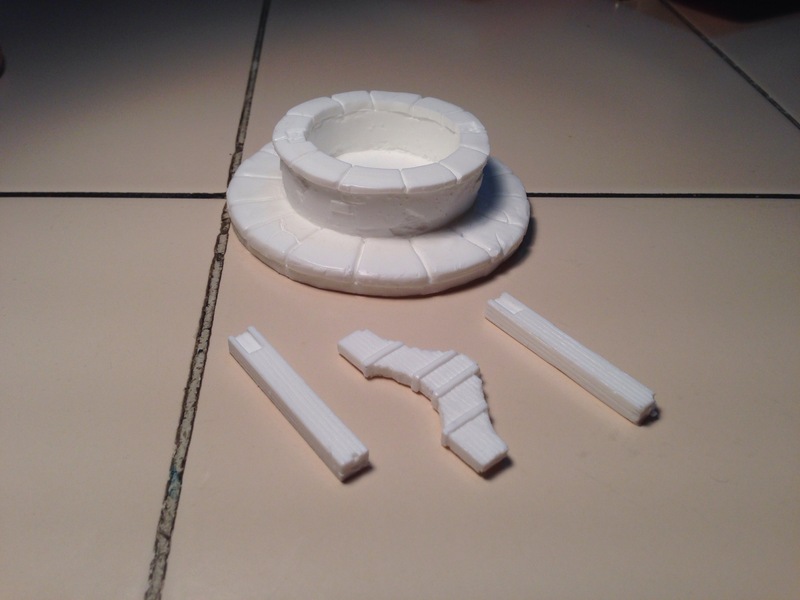 The first mold is for the base structure. The second mold contains the three pieces of the upper wooden structure. These molds were made from Smoothe-On. Assembling the castings was easy and painting was pretty fun as well in adobe colors to match the rest of the growing caribbean port. I can definitely see opportunities for custom details like barrels and buckets. Perhaps rope and a pulley. An overflow pipe midway up the wall flowing into another bucket if the structure is spring fed. 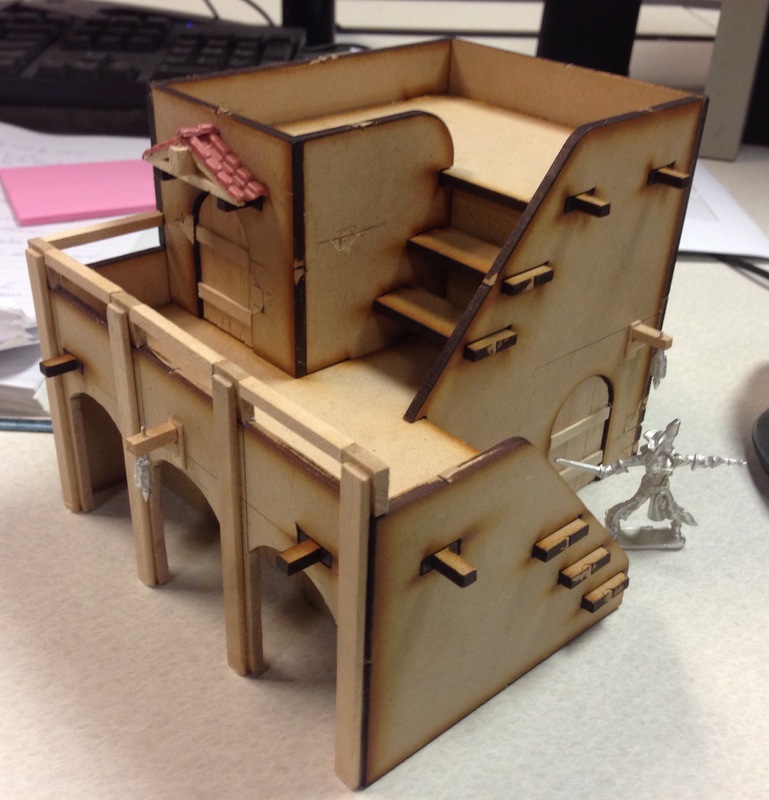 Here is my “finished” model. I’m considering casting up some more and putting them in the store if there is any interest. 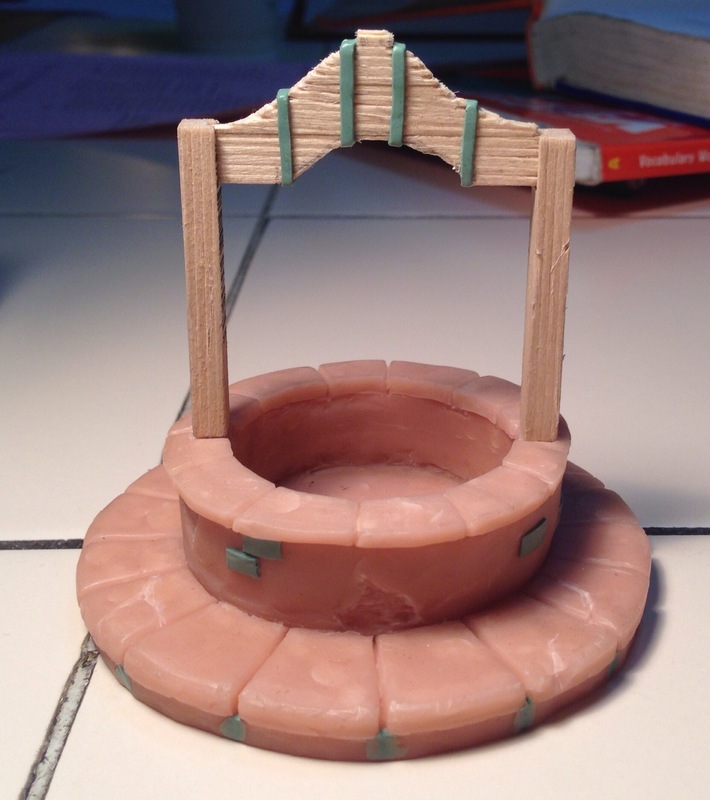 This was my first real attempt with resin casting terrain pieces. I think it went well. I considered casting the upper structure in pewter but decided to try the resin first just to see how it went. Let me know what you think.